Willis McGahee has been a mainstay in fantasy drafts for over half of a decade now. Despite playing for rather pedestrian offenses with the Buffalo Bills and Baltimore Ravens, McGahee continues to produce at a solid enough rate to be drafted as a late 1st rounder most years. In 2007, Willis McGahee was a model of consistency, putting up similar numbers virtually every week. Unfortunately, besides for the second half of his second year in the NFL, Willis McGahee has never had a sustained period where he’s been a standout fantasy star. Teams drafting in the bottom half of the fantasy draft will once again be faced with the decision to draft Willis McGahee this year. As usual, the quarterback situation around McGahee will be grim, which should limit the upside of his offense. Once again, Willis McGahee will be the focus of the offense, which is more than can be said for most starting running backs in the NFL. People drafting Willis McGahee will be banking on another year of unspectacular consistency from the Baltimore Ravens running back, while hoping he somehow turns into a scoring machine. I wouldn’t bank on it, and I wouldn’t draft Willis McGahee until the 2nd round. Willis McGahee played on the 2001 University of Miami squad which won the National Title. Clinton Portis was the starting running back on that Hurricanes team and McGahee played significant time as a fullback. The next year, Willis McGahee was once again slotted as a fullback, as Frank Gore was installed as the Miami Hurricanes’ feature running back. Gore tore up his knee early in the 2002 NCAA season, which pushed Willis McGahee into the starting tailback roll. He went on to one of the stellar regular seasons in NCAA history. Willis McGahee scored 28 touchdowns on 282 carries, while also gaining over 1,700 yards rushing for the Hurricanes. These numbers set him in the Top 5 all-time for single season touchdowns in college football. Once again, the Miami Hurricanes went undefeated in the regular season and were a prohibitive favorite to defeat the Ohio State Buckeyes in the 2003 Fiesta Bowl. Unfortunately, Willis McGahee tore up his knee in the Fiesta Bowl in a grisly fashion, with the kneecap being dislocated and most ligaments being torn. Some feared Willis McGahee would never played competitive football again, and it was certain that McGahee — thought to be a lock as the #1 overall pick in the 2003 NFL Draft — would not play ball for at least a year. Willis McGahee lost millions of dollars with the post-season knee injury. It was a testament to the display of talent Willis McGahee put on in the 2002 season that he was still a 1st round draft pick in the NFL draft. The Buffalo Bills, knowing he would not play for a year, chose to select McGahee as the 23rd overall selection of the draft. The Bills liked McGahee’s combination of size, speed, blocking ability, catching ability and character, and were willing to wait a year to have such a player on their team. It was wondered whether Willis McGahee would be the runner he was in college, but he convinced the Bills he would make a full recovery. The 2004 found Willis McGahee as the Buffalo Bills feature back. He would go on to play in all 16 games, though his production was only average at first. By the second half of his 2nd season (his first playing for the Bills), Willis McGahee was a standout, putting up some of the best numbers in the NFL. He would finish the year 1,100 yards and 13 touchdowns, which made him a fantasy football stud. The 13 touchdowns are the best of his career so far. 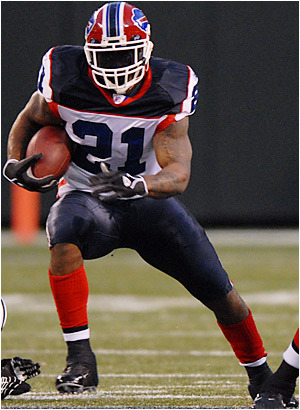 In 2005, Willis McGahee topped 1,200 yards rushing, though his touchdowns (5) trailed off dramatically. The 2006 season saw Willis McGahee sustain injuries that kept him completely out of two ballgames, and he came up just short of a thousand yards. His touchdown totals once again were disappointing, as he had only six of them. By this time, the Buffalo Bills were under a new front office and coaching staff, and there were reports of McGahee’s discontent with the team. It became widely reported the Buffalo Bills were shopping McGahee. Sure enough, the Baltimore Ravens traded for Willis McGahee. The Ravens had dropped Jamal Lewis in the offseason and were looking for an every down runner. Meanwhile, the Bills drafted Marshawn Lynch in the 1st round to be their star RB. The Baltimore Ravens were coming off a season where they won their division and played in the 2nd round of the playoffs. Steve McNair had led the team on the playoff run, and the team had finished 13-3 the previous year. The Ravens had experienced a tough playoff loss at home to the eventual Super Bowl champions, the Indianapolis Colts. The Ravens built their team around a hard-hitting defense and a conservative, running offense. Chester Taylor was gone and Jamal Lewis looked to be wearing out, so Willis McGahee appeared to be the perfect solution. McGahee did his part, once again topping 1,200 yards on his largest yards-per-carry average of this career. His touchdown total (7) was once again disappointing, though this was mainly a result of the awful Baltimore Ravens defense. McNair was hurt a significant amount of time and Kyle Boller was as lackluster as ever. The Ravens fell from a playoff contender to the worst in their division, while Superbowl winning coach Brian Billick was fired in the offseason. Watch out drafting Willis McGahee in 2009. McGahee is no longer the starting running back for the Baltimore Ravens. 2nd year running back, Ray Rice, has a phenomenal offseason and he was named the starting RB before training camp even started. What’s more, Ray Rice has looked terrific in limited preseason game time, collecting 8 receptions in a little over one half in Week 3 of the preseason. Draft Ray Rice and let your opponents draft Willis McGahee too high. Barring injury, Willis McGahee is not going to have significant carries to be a fantasy football factor in 2009. Willis McGahee is reduced to being a handcuff player. Willis McGahee was less effective last year with the Baltimore Ravens already, because they used a running back by committee approach with La’Ron McClain and Ray Rice. But this looks like the end of the line for Willis McGahee – at least in Baltimore. The Baltimore Ravens quarterback situation colors Willis McGahee’s fantasy value in 2008. The team will either start Kyle Boller or rookie 1st round draft pick Joe Flacco. While Flacco might turn out to be a stud NFL passer, I don’t think anyone expects him to take the NFL by storm in 2008. The Ravens new coach, John Harbaugh, was a special teams and defensive coach with the Philadelphia Eagles, so expect him to play a ball control, field position brand of football. All of that points to a highly conservative game plan. That has its advantages for Willis McGahee. I expect the team will run him around 300 times this season, trying to protect their quarterbacks and shorten the game. But the Baltimore Ravens’ offense is likely to sputter so much that McGahee’s touchdown total will suffer (once again), and I wouldn’t expect to see him get double digits in touchdowns in 2008. One factor in McGahee’s favor is the installment of Cam Cameron as the new offensive coordinator. Cameron was a disaster as a head coach with the Miami Dolphins last year, but his time as an offensive coordinator with the San Diego Chargers two years ago was stellar. Cam Cameron coached LaDainian Tomlinson to the single-season touchdown record. Also keep in mind that, even with the horrible season the Dolphins were having last year, that Ronnie Brown was the leading scorer among running backs in most fantasy leagues when he was lost for the season with a knee injury last year. So Cam Cameron knows how to get his running backs production. He’ll have to be a wizard to coach McGahee into top of the fantasy boards stats this year. Cam Cameron was at least coaching either superior talent or veteran quarterbacks with the Chargers and Dolphins, and he’s going to have to coach up either a true rookie or Kyle Boller, which might be more difficult. So pass on Willis McGahee in the first round for a back with a higher upside (remember his touchdown totals these past three years when you are tempted to draft him on draft day). If you get into the 2nd round and are determined to draft a second runner, grab McGahee if you must and hope Cam Cameron can work wonders for his totals. Let that sink in…Cam Cameron…Kyle Boller…rookie quarterback…and then decide if you want Willis McGahee on your fantasy team this year.